The CDEâ€™s Educational Data Governance (EDGO) program assigns data-related roles and responsibilities, develops and supports data-related policies, and facilitates collaboration on issues related to CDE's educational data assets. Data governance is an organization-wide collaborative program establishing data-related policies, procedures, roles, and responsibilities. The California Department of Education's (CDE’s) data governance program is called EDGO (Educational Data Governance). Resources, tips and tools are provided to assist California educators interested in establishing and maintaining data governance at the local level. Highlights from the CDE's journey to establish and implement a data governance program may be helpful to those seeking to establish data governance in their own organization. Though the CDE had strategically-placed data experts throughout the department, until 2015, data-related policies and procedures were sometimes inconsistent and/or ad hoc. Recognizing increases in both data risks and benefits, the CDE’s data stewards and managers developed a proposal for formalizing greater collaboration to manage, standardize, protect, and strategically use the CDE’s educational data assets. Inspired by the proposal, the CDE’s Executive team approved the EDGO Charter and authorized the establishment of an official data governance program. The CDE’s EDGO Program officially launched in January 2016. Guided regular engagement of the CDE’s data experts. Clarified data-related roles and responsibilities. Prioritized data-related work to align with the CDE’s Vision, Mission, and Goals. Established formal channels and procedures for raising and vetting data-related issues. Encouraged celebration and recognition of all the great data-related work happening at the CDE. Been instrumental in promoting data privacy training for hundreds of CDE employees/vendors, the release of the CA Schools Mobile App and California School Dashboard , and more! Through monthly meetings, quarterly department-wide highlight sessions, presentations given to external stakeholders, annual EDGO-sponsored events, and participation in professional data governance opportunities, the CDE continues to refine, refresh, expand, and celebrate the EDGO Program. Projects and initiatives for the CDE's EDGO are guided by specific goals to maximize the privacy, transparency, quality, and utility of the CDE's data assets. Foster Educational Data Stakeholder Confidence by clearly communicating what educational data are collected, why the data are collected, and how the data are handled, managed, reported, and used to support a world-class education for all students, from early childhood to adulthood. Increase Educational Data Quality and Standardization by supporting CDE staff and local educational agencies (LEAs) in understanding, interpreting, and complying with standards, reporting requirements, and data use best practices. Minimize the Educational Data Reporting Burden for LEAs by minimizing redundant, obsolete, and/or transitory (ad hoc) data collections. Enhance Educational Data Privacy and Security by clarifying roles, responsibilities, and expectations related to the collection, maintenance, and retention of educational data. The CDE's Data Privacy Web page provides information, resources, and best practices for parents and families, teachers, LEAs, and the general public. Frequently asked questions (FAQs) relating to EDGO. Why should schools and districts consider starting a data governance program? Data is the best way to ensure that the kids in your school or district receive the education and services they deserve to succeed. This said, risks and benefits of data are increasing all the time. Schools and districts that want to maximize data privacy, accuracy, and utility while minimizing risks should approach data collaboratively and holistically. The goal is to create a universal understanding of data-related roles and responsibilities so that parents and families, educators, and stakeholders can have confidence that data is safe while using data appropriately to make important decisions. The EDGO Resources section contains information to help schools and districts get started. Who should lead data governance efforts at our school/district? Research related to successful data governance indicates that the programmatic/business side of the organization should guide data governance efforts. While compliance (e.g., IT and legal) supports and facilitates data governance efforts, ensuring buy-in from those on the business side of the organization (e.g., administrators, teachers, school staff) is the best way to ensure success of a data governance program. Who should be included in a school or district’s data governance program? ongoing access to data (especially student data). what training/policies are needed to ensure that everyone understands their data-related roles and responsibilities. Consider who manages, uses, and protects your school or district’s data. Include them in data governance collaborations to ensure your school or district’s data is governed in accordance with law, policy, and best practices. What is the best way to keep up on data-related laws, policies, and best practices? The CDE curates and maintains resources related to Data Privacy. Check back frequently for updates! Specific questions related to data governance can also be submitted to edgo@cde.ca.gov. Additional resources to assist individuals in understanding and implementing data governance. The following is a list of outside resources developed and maintained outside of the CDE. While not vetted or endorsed by the CDE, these resources are developed and maintained by the CDE's trusted partners and may provide assistance in understanding data governance. Resources to help explain the transformative power of securely-handled, responsibly-managed, transparently-shared data. This 2:33 Data Quality Campaign video provides an overview of the potential for securely-handled, well-managed, connected, quality, transparently-shared educational data. This guide provides English and Spanish version common-core aligned, grade-leveled lessons, activities, and parent and family tip sheets to help guide kids in being conscious and kind in the data and digital content they create, share, and consume. Resources to help establish and maintain a data governance program. This resource provides guidance on roles, responsibilities, and tasks to consider when developing a data governance program. Under the umbrella of the NCES, the NFES forms working groups to address specific data-related issues and produces many data-related reports, best practices guides, and technical publications, in addition to those listed below. This downloadable PDF is intended to empower more effective use of data as information. This downloadable PDF is intended to help educators in communicating education data in accessible, accurate, and actionable visual formats. This downloadable PDF is intended to help craft messages that communicate the value of data governance. A Non-Profit, Vendor Neutral Association of Business, IT, and Data Professionals Dedicated to Advancing the Discipline of Data Governance. This Web site features articles and practical tips for starting and maintaining a data governance program. Data Governance information and resources for educators. What do Educators need to know about data governance? Data quality starts with the initial information input into data systems. Ensuring that data is accurate, complete, secure, and standardized from the moment the data is inputted maximizes the utility of the data downstream to show trends, tailor educational interventions, and make important educational decisions. Student attendance, assessment scores, and photos downloaded to a Web page are all examples of data that educators can input. Educators have access to personally identifiable information that can be breached. Strong passwords and data privacy best practices help to secure the data. Educators need to communicate with and about students in a way that upholds privacy laws. Educators need to ensure that those with access to student data (e.g., classroom helpers, parent and family volunteers) understand laws, policies, and best practices related to data management/data privacy. What should Educators do to protect student data? Be aware of all district and school policies on student data. Contact technology staff at your local educational agency if you receive an e-mail that appears to be from a questionable source or has questionable content (e.g., an e-mail requesting password or student information). Be aware of current technology scams (e.g., phishing, spear phishing, whaling, and ransom ware). Annually review student privacy federal and state laws and best practices through the CDE Data Privacy Web page, or the US Department of Education’s Protecting Student Privacy Web page. Teach students to be kind, safe digital citizens and encourage them to share what they learn with their families and communities using resources like Common Sense Education’s Digital Citizenship & Social Emotional Learning Guide (PDF). 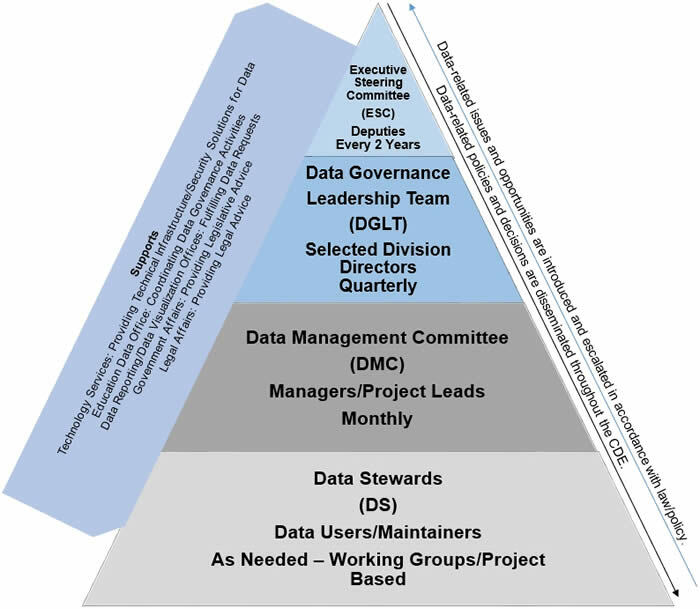 Accessible Version of the following Educational Data Governance Model graphic.